Happy Sunday, I hope you are having a great day! I'm laying low today...my youngest had prom yesterday and I was non stop with him and his friends until after midnight. It was fun seeing them have such a good time but boy what a long day! Thankfully there is a new challenge from Sunday Stamps to help me relax! 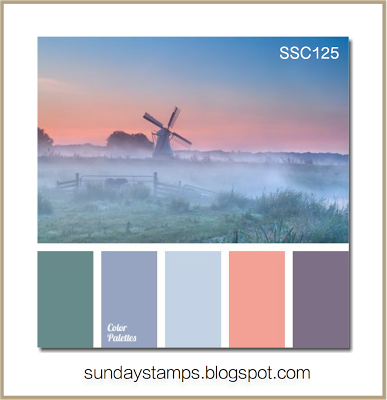 This week we have a color challenge. Color challenges are really hard for me, I prefer sketches. I think it's because sketches are usually so cut and dry, and color challenges can really go in different directions. With these particular colors I just kept it simple, I didn't want anything overwhelming. I used a mix of MFT and SU products to create this card. Ah-mazing card this week and your photo is delightful! I really appreciate the simplicity of this card, and the perfectly placed scattered sequins. Gorgeous.